The other day someone asked me what I meant by "real grits". I think the problem that people who hate grits have is they haven't had "real grits". They have had soupy, bland, quick cooking grits. I don't blame them. I hate those grits too. I think the only person that would like "those grits" is that kid that ate glue back in first grade. Whatever happened to that kid anyway? Here are a few signs you are making "real grits"
They aren't "instant" or "quick cooking"
They come in a bag, probably not a box. They take at least 30-45 minutes to cook. Anyway here is how I did mine tonight. Bring water and a "healthy pinch of salt" to a boil in a medium pot. Stir in the grits, reduce to a simmer and cook uncovered. You will need to stir them every few minutes throughout the process. Preheat a charcoal grill to 350f set up for direct heat. 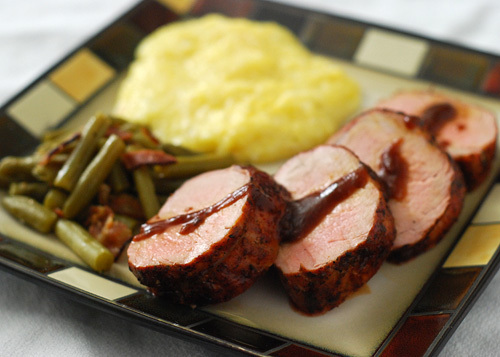 Mix the dry seasonings together and season the pork tenderloin. After the grits have been simmering (and stirred. You're still stirring them, right?) for about 30 minutes, place the tenderloin on your grill and cook with the lid closed. Turn the tenderloin every 5 minutes. When the tenderloin reaches an internal temp of 120f (about 15 minutes), brush with the BBQ sauce and continue grilling. When the tenderloin reaches in internal temp of 140f, remove from the grill and let rest for 10 minutes. Your grits should almost be thickened. Stir in the cheese and butter until it melts. Taste grits for seasoning and add salt and pepper. I added another pinch of salt and maybe a 1/4 tsp of pepper. 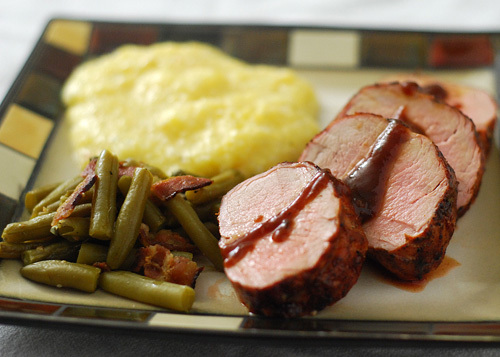 Slice the tenderloin into 3/4" slices, drizzle with extra sauce, and serve with the grits. I used grits from Bear Creek Milling that we bought at Mast General Store . They are ground on a 100+ year old mill stone. When I say "they", I guess I should say Bobby. I googled the company and came up with this link for their sister company. I thought it was cool getting to see the people that actually make the products. I used Tennessee's Best Apple Butter BBQ Sauce that we picked up at a local market last summer. We bought it for the boys who love apple butter but I expected it to taste weird. 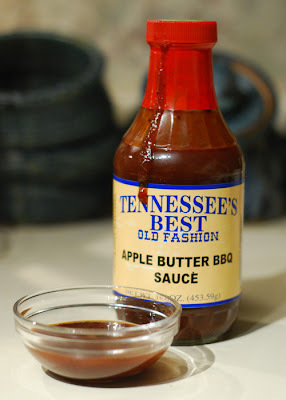 Turned out it was a good BBQ sauce, tangy and sweet. Ok, I painted on the "drip"...sue me. Only thing missing is a big ol' biscuit.